CARBON further extends the synthesis of resources normally used in Orrico’s performances: body, graphite, plane, time and space. 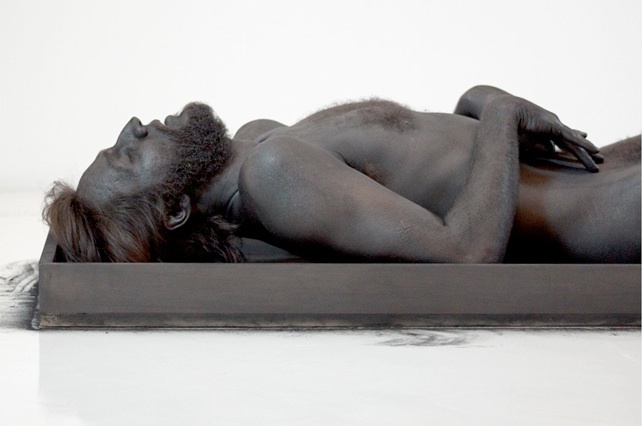 From eight specific actions that begin on a paper and culminate in the transformation of the body into graphite, the viewer can witness an evolution of his performative art practice. The repetitive actions which at first glance may seem absurd become powerful reflections on life cycles, energetic flows and complementary opposites. The repetitions that lead to exhaustion become deep metaphors about life and death simultaneously. The material trace of ‘where the body once was’ within the new work becomes paramount. It asserts an aesthetic autonomy for the art object in relation to the performative act while maintaining the striking visual correlation between body and material that Orrico is known for. Tony Orrico, /Vessel for Governing and Conception/ (Polyforum Siqueiros, MX) 2012.